In the 1970s, there was a real push for UK broadcasters to try and create series that could be sold overseas to the US market. Generally, a very traditional way of making television in the UK would be to shoot the interiors of a series on videotape in a studio while the exteriors would be shot on film or possibly in some cases on videotape. There are people out there who do not like that look though I am personally am a big of fan of it. The problem comes from that with the interiors and exteriors shot on 2 different mediums, to some it looks jarring. Others believed that anything shot on videotape looks cheap. I feel like I need to jump in again and say I don’t agree with that. To take a skewed look at a classic analogy, it’s not what type of paper the book is printed on but what is inside it. A little abstract? Possibly! There is a history of series that changed their look to appeal to the US market. One of them was The Avengers. For its fourth series, production moved from a videotaped produced series to a film series to try and get interest from the states. Special Branch took it one step further…. On September 25th Acorn Media will be releasing Special Branch Set 1. This will be covering the first 13 episodes that starred George Sewell as DCI Alan Craven and Patrick Mower as DCI Tom Haggerty. The title “Set 1” is a bit of a misnomer. The episodes on this set cover episodes that ran in 1973. As it happens, this is actually Series 3. Special Branch started in 1969 as a Thames television series. It started off in black and white shot on videotape. It was made mostly in studio with exteriors being shot on film and then videotape. The series starred Darren Nesbitt as DCI Jordan. Special Branch took a hiatus after the 1970 series and got re-tooled. 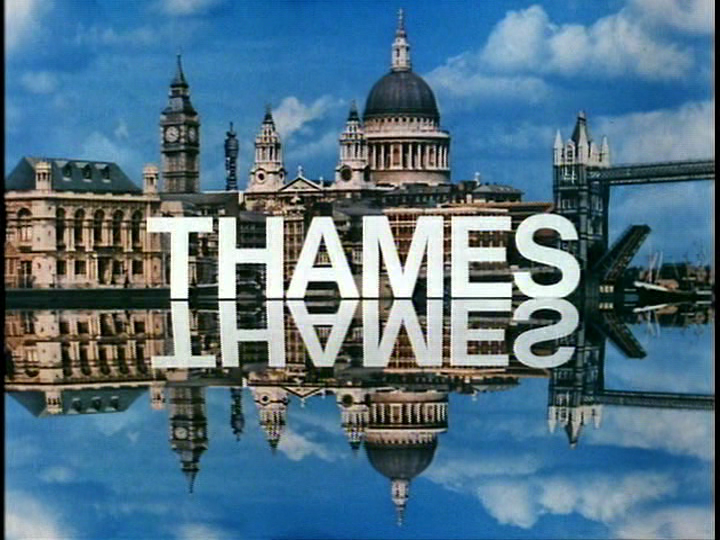 The revamped Special Branch became the first production of the Thames subsidiary Euston Films. Started by Lloyd Shirley, George Taylor, and Brian Tesler, they decide on an approach to a new style of making television for the UK and hoped to sell it abroad. First, they dropped the videotaped approach. All the series would be shot on film and on location. This meant no studios at all. If they needed to shoot something in a flat, they would shoot it in a flat. Another big change would be that each series would have 2 film crews working simultaneously on an episode. Once again, they could get through production quicker. When watching episodes on this DVD set, when Haggerty is in the series, it is obvious that these two film crews are at work. There is a large part of these episodes where Craven and Haggerty are doing separate parts of the same investigation, I am sure these were being shot simultaneously or it could be a simple as a B crew going around taking pick up shots. If Euston Films sound familiar to you, other programs they made were Van Der Valk, The Sweeney (which also included 2 feature films), Reilly: Ace of Spies and Quatermass. 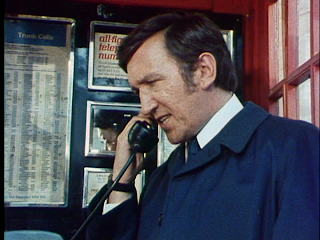 We are introduced to Craven in the first episode, A Copper Called Craven. It is a strange way to introduce a character as we hardly know him but he is immediately charged with accepting a bribe. The whole episode revolves around him trying to prove his innocence. We are not introduced to Haggerty until the second episode, Round the Clock. Haggerty is interesting. He is not in all the episodes but when he is, he makes the program better. Craven is a some-what gritty officer but follows procedures pretty well and is able to get the information he needs. Haggerty does that but there is something a little more loose-cannon about him. In some ways, he is more human. In Death by Drowning, the husband of an important MP is found dead in the Thames. It’s a Sunday; Craven and Haggerty need to start the investigation now. Craven is ready to start but Haggerty is having trouble getting going. He is horribly hung over. It makes him a little more realistic. About half the episodes do not feature Haggerty in them. 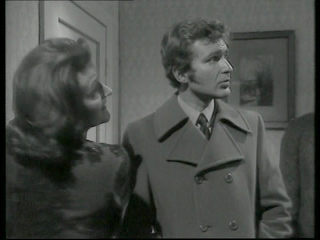 When the series returned in 1973 with the new character of Craven but also starred Roger Rowland as Detective Sgt. Bill North. Now, Roger Rowland did appear in an episode of Special Branch from 1969 called Troika but not as Bill North but as DCI Felding. Not the same character. The problem with Bill North is that he is a subordinate who does what Craven needs. 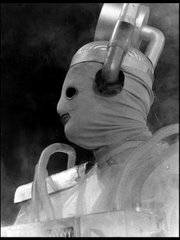 The people making the series were concerned that it was lacking punch from its characters and brought in Patrick Mower as Haggerty. Haggerty and Craven often lock horns and disagree. Patrick Mower was brought in when six episodes had already been shot. So they shot the remaining seven with him and sprinkled them into the series so it looks like Haggerty is basically there throughout the third series. There are also times when they get along really well. To give the series some depth, it made sense to put them together in the series. George Sewell and Patrick Mower play the part really well together. With the series being shot on location, there are all sorts of interesting things to see. The series was shot in London. For people who love British television series like Lovejoy and Midsomer Murders where there is glorious country-side and quaint villages or even like Sherlock which shows London as a sophisticated and beautiful place may be disappointed with the locations. This is a series about anti-terrorism and crime. A lot of the action takes place in areas that are less than perfect. Let’s face it, it is gritty and bleak. There are a lot of rundown buildings. The episode Red Herring has some very ghetto-esque places. Even though the quality of the episodes is fine, the colour palette for much of these episodes are pale. A lot of greys. There doesn’t seem to be a lot of sunny days. Of course, these episodes were made before everything would be colour graded in post-production. Now, if you shoot on a cloudy day there are ways to make it look better weather-wise than what it was on the day the scenes were shot. No in these episodes! While watching this set, I was thinking about how people want to make television series more real. Often the response to this is to make something grittier. Maybe more blood, maybe when someone hits someone else the sound is more violent. 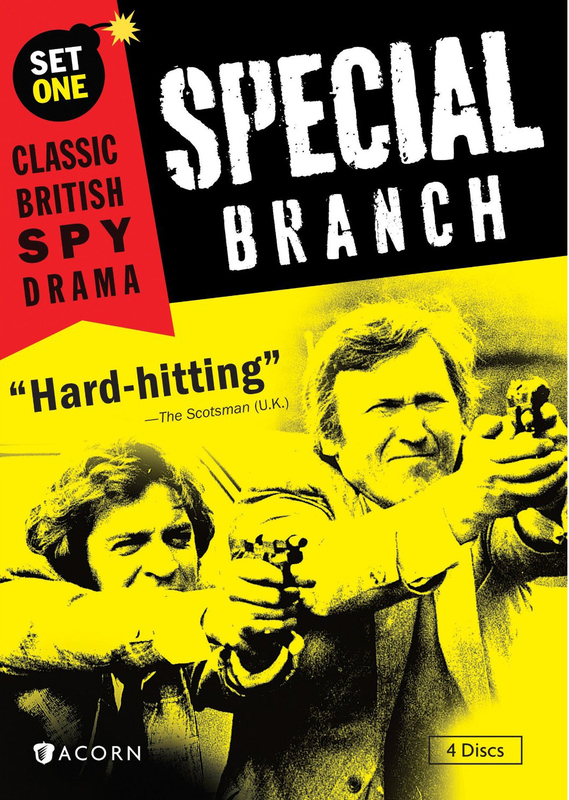 I think Special Branch comes across much more realistic but in a different way. There is a ton of shots with us, the viewer, in the car driving around with Craven and North. We are driving with them as if we are in the backseat and they are in the front. There is rarely any incidental music but just the sounds of people doing their jobs. Like in Red Herring, Police need to clear the street because of bomb that is in a parked car. Just the sounds of all the vehicles and people doing their jobs running around to make people safe makes the series very believable. The down side to this could be that some of this takes a while to unfold. Sometimes it doesn’t happen very quickly. The pacing can sometimes be a little slow but I found when Haggerty is in the series, that isn’t the case. As soon as Haggerty is in an episode, an officer at the same level as Craven can do some investigations. The plot becomes much more complex. There are a couple of things going on in Death by Drowning, the story is not so straight forward in regards to the death of the husband of an MP. The investigation takes two separate directions where Haggerty and Craven need to figure out what they need to do. Whereas episodes like Red Herring, Polonaise or even a Copper Called Craven seem to have one strong plot that we eventually come to an end with at the finale of the episode. Sometimes, such as Polonaise, the resolution of the episodes can seem a little flat. We take all the time to get here and when we do, I am sometimes left scratching my head thinking, “Is that it?” Once again the episodes that have Haggerty in them seemed to breathe fresh life into them and since those episodes were sprinkled throughout the broadcast order of episodes, it doesn’t bother me at all. As a big fan of British television, there were a lot of faces I saw that I recognized from other programs and were glad to see them like Tony Selby, Peter Jeffrey, Clifford Rose, Angus MacKay, Andre Morell, Richard Marner, Norman Jones, Roger Lloyd-Pack, Dennis Chinnery, Geoffrey Bayldon, James Bree, Stephanie Beacham, Michael Gambon, Mark Eden, and Ronald Leigh-Hunt. If you do not know who these people are, they have appeared in everything from ‘Allo ‘Allo, Only Fools and Horses, Quatermass and the Pit, Doctor Who and so much more. There is one extra on here but it is a pretty cool one. It is an interview with both Patrick Mower and George Sewell. They are done separate to each other but it is really informative. They both speak fondly of the series and each other but I was really impressed by how much they knew of the history of Special Branch. They knew about how much revamping was needed and why the formation of Euston was so important. I know they were there at the time but sometimes you just don’t get as informative of interviews. It is a real highlight of the set. It looks like it was imported over from the UK set distributed by Network DVD. I can only say that when Acorn Media is able to bring stuff over from Network DVD, everyone wins. I have quite a few of Network releases and they are impeccable with quality and depths they go through with extras. One of the highlights in my collection from Network is the Upstairs Downstairs collection and they extras on these are breathe-taking. I believe some of those extras showed up on the recently released Upstairs Downstairs sets by Acorn Media. What I also like about this extra is that we get a clip from a black and white episode of Special Branch. I love the look of black and white British television and when I saw it I was immediately reminded of an episode of the not seen in the US series Public Eye. 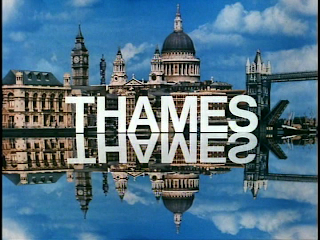 Both produced by Thames Television. What is also nice about this extra is just seeing an interview with George Sewell, this extra was produced in 2004 and George passed away in 2007. These types of extras start to become precious. A shot from the 1969 version of Special Branch in the Sewell/Mower interview extra. Seeing as the extra was ported over from the Network release I have no reason to believe that these are the same episodes used as was used in the UK release. Each episode starts out with the Fremantle logo and jingle which I am not a huge fan of since they have been recently added to the episodes but seeing that they own the series, there really is nothing anyone can do about it. More importantly, the Thames opening is left intact. You know what I am talking about especially if you ever saw Benny Hill or Danger Mouse. It looks like the ad caps were missing and I am not sure if they are present on the Network release. I really am a purist and like the ad caps. That’s the bit that shows the logo of the series just as it goes into commercials. It would also normally say “End of Part One”, etc. The quality of the prints used for this release look fine to me. They are not perfect nor would I say remastered. They look to me (and I could be wrong) that they are new prints made of the episodes since they look pretty good condition but no remastering or clean-up has been done to the prints at all. I’m fine with that. They look great and there are some scratches to the prints here and there but the colour looks strong and consistent throughout the episodes even if the look of the overall series has a bleakness to it. The set comes in a standard size Amary DVD case that holds four discs. It also has a sleeve that goes over the case. You certainly couldn’t mistake this DVD with anything else as it is a bold yellow, red, and black cover with Haggerty and Craven in a shot that makes them look like Starsky and Hutch. It says on the cover “Classic British Spy Drama” and I am not totally sure I agree with this. I would hold such distinction for a series like The Sandbaggers but what I like about this series is the anti-terrorism piece to it. There are some international moments but these guys are police and investigators more so than spies. The episodes range from good to very good. 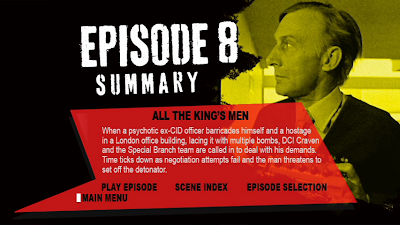 It is clear that when the new Special Branch came back, it was not only getting used to its new format but the way it was being made under the newly formed Euston Films. Regardless, it is very enjoyable and there are going to be some episodes I am definitely going to go back to watch. I hope there will be a “Set 2” of this series and if there is enough interest, I hope that Acorn Media thinks about releasing an “Early Years” set so we can enjoy the original episodes with Darren Nesbitt. 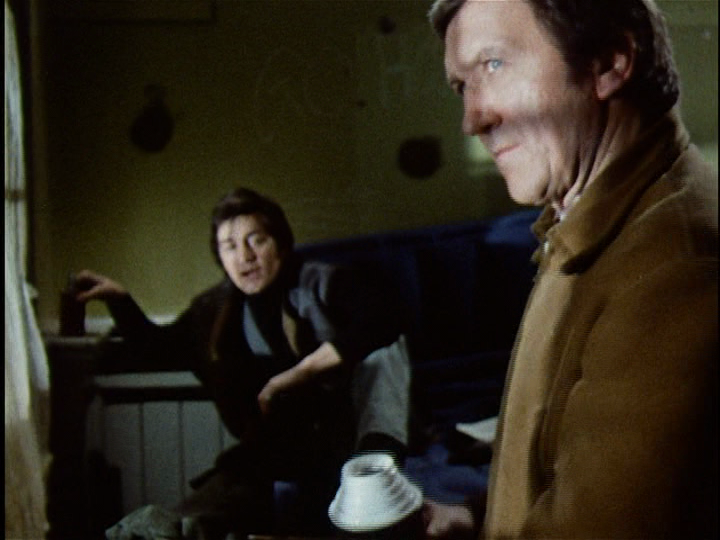 Disc 4: You Won’t Remember Me, Hostage, Blueprint for Murder; Interview with George Sewell and Patrick Mower (17 minutes). 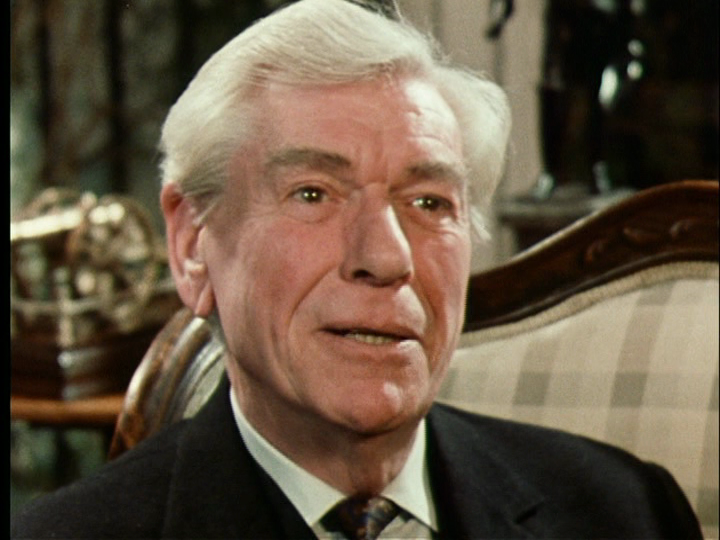 This week: In a day or so I will post my review for the new Midsomer Murders set Mayhem and Mystery Files and this weekend will be my first article for the Bond @ 50 celebration with Dr. No.